1. The Moon is Earth’s lone natural satellite. 2. The Moon is the fifth largest satellite in our Solar System. 3. The Moon is a little more than one-fourth the size of Earth. 4. The Moon’s diameter is 2,160 miles (3,476 km). 5. 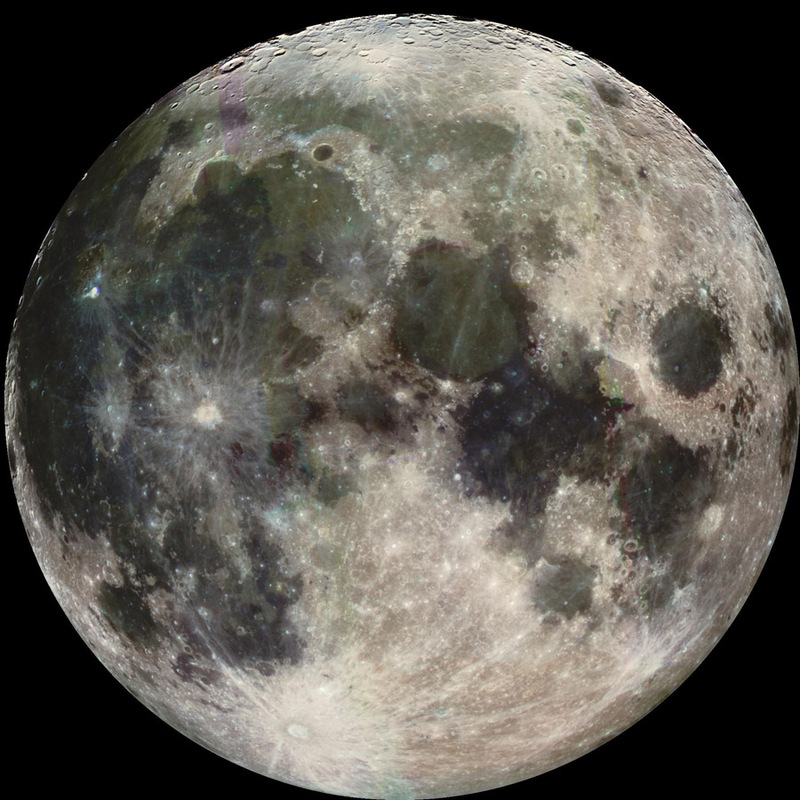 The Moon’s total surface area is 14,658,000 sq. mi (37,932,000 sq. km). 6. The Moon rotates at ten miles per hour. 7. Average distance between the Earth and the Moon is about 239,000 miles. Actual distance varies from 221,457 to 252,712 miles. 8. The Moon’s gravity is 1/6 that of Earth. 9. Closest distance between the Moon and the Sun is 91,341,565 miles (147 million km). 10. The speed in which the moon orbits the earth is at 2,300 miles an hour. 11. If you weighed 100 pounds on Earth, you would weigh 16.6 pounds on the moon. 12. The Moon does not have an atmosphere; there is no wind on the Moon. 13. Temperatures on the moon range from 253° F (123° C) to -387° F (-233° C). 14. The Moon’s gravity affects the oceans on earth. 15. When the Moon is directly above you and you are along the coast, you will encounter a high tide. 16. Neil Armstrong became the first man to walk on the moon. 17. Apollo 11 was the American space mission to first reach and land on the moon. 18. Only one side of the Moon is visible from earth at any given time. 19. The moon has four phases, the first quarter, last quarter, the full moon, and the new moon. 20. Lunar eclipses occur when the Earth is located in between the Sun and the Moon. 21. Solar eclipses occur when the Moon is between the Sun and Earth. 22. The Moon orbits around the Earth every 29 days. 23. The craters found on the moon’s surface are caused by asteroids and comets when they crash onto the surface of the moon. 24. There are more than 300,000 craters on the moon at more than one kilometer wide, just on one side. 25. It takes the Moon the same amount of time to rotate on its axis that it takes to orbit around the Earth. 26. A Harvest Moon is actually a full moon that appears during the autumnal equinox, which is around September. 27. A Hunters Moon is sometimes called the blood moon and even sanguine moon. This full moon occurs after the harvest moon. 28. A Super Full Moon appears brighter and larger than a normal full moon. This occurs a few days prior to spring equinox. 29. The ashes of Dr. Eugene Shoemaker, a man who was declined to be an astronaut due to medical conditions, were flown into a crater on the moon on July 31, 1999 as his dying wish. 30. Any footprints made by astronauts on the moon are still there and will remain for millions of years because the moon has no atmosphere or wind. 31. Astronaut Alan Sheppard drove a golf ball 2,400 feet, or almost half of a mile, while on the surface of the moon. 32. Back in 1988, of people who were surveyed by the Lowell Observatory of Flagstaff, Arizona, 13% believed that the moon’s surface was indeed made of cheese. 33. Of the things that have been left by humans on the moon, some include: Apollo 17 commander Eugene Cernan’s camera, human waste from astronauts, commemorative plaques, American flags, defunct lunar rovers and mirrors that NASA uses to gage the distance from the Moon to the Earth. 34. The moon is shaped like an egg, with the larger end pointing toward the Earth. 35. President Nixon had a speech ready to read in case the moon mission was a failure. Copies of the transcript can be found online. 36. The American flags left on the moon are most likely bleached white now from solar radiation. 37. During the Cold War, the United States had considered detonating nuclear weapons on the Moon to demonstrate its power to the Russians. this stuff is awesome it helped me so much with my science project power point thank u so much people who created this website ir i could i would rate it a billion stars like if there was such a thing but there is not but i would to that. This website is AWESOME AWESOME AWESOME!!!! hey. did you know that sometimes when you look at the moon in a telescope, it will look like there is water on the moon. Isn’t that cool and amazing? The moon is AWESOME!!!! But I like Pluto more though because Pluto is so small and cute!! So is the dog Pluto. If you watch Mickey mouse then watch out for Pluto!!! i went on this site so i could find information for a science project at school, but my friend an i just ended up looking at the comments the whole time THEY ARE FUNNYYYYY;) haha josh hutcherson forever!!!!!! i wanna make love on the moon! like make babys! whoo i wanna marry the moon. love you moon. i love itSaturn is the second largest planet. Only Jupiter is larger. Saturn has seven thin, flat rings around it. A couple of planets have rings, but their rings are much fainter than those around Saturn. Saturn’s diameter at its equator is 74,600 miles which is almost ten times that of Earth. The planet can be seen from Earth with the unaided eye, but its rings cannot. Saturn was the farthest planet from the earth that the ancient astronomers knew about. They named Saturn after the Roman God of agriculture. Saturn’s rings are made up of billions of pieces of rocks and dust. This is awesome! I’m doing a Mobile for my project, and I choosed the Moon. The Moon is a unque surface of space and I’m glad to be doing my project on it. I cant wait to get an A+ on my Mobile! this is such an awesome website. it helped me so much with my science report for school. 🙂 thanks planetfacts.org! haha all of you guys are wierdos ^ js. the moon is actually very interesting. even though i hate school and science. i enjoy learning abt the moon! There are 8 phases of the moon not 4, new moon, waxing crescent, 1st quarter, waxing gibbous, full moon, waning gibbous, 3rd (last) quarter, and waning crescent. I have been surfing on-line greater than 3 hours lately, but I never discovered any fascinating article like yours. It’s lovely value enough for me. In my opinion, if all website owners and bloggers made good content as you probably did, the web will be much more useful than ever before. This site is AMAZING! It’s helped me so much with my work! Thanks! !